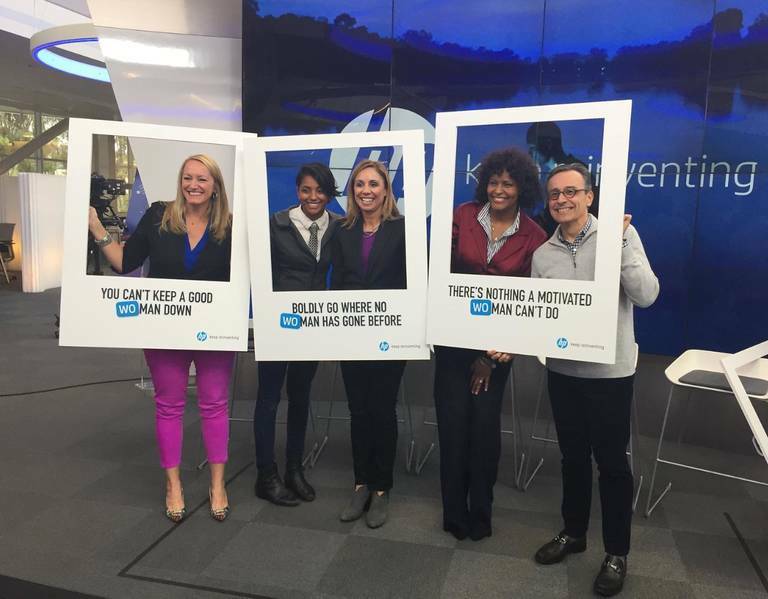 (L TO R) HP General Manager and Global Head of HPS Business Anneliese Olson, Labs research scientist Mithra Vankipuram, Chief Legal Officer Kim Rivera, Chief Diversity Officer Lesley Slaton Brown and Global Chief Marketing Officer Antonio Lucio celebrating International Women’s Day in 2017. The cure for systemic unconscious cultural bias in business is a systemic overhaul of corporate values from the top down. Not many companies have managed to immerse themselves in this diversity and inclusion challenge more than HP Inc. In 2015, when the Hewlett Packard Company split into 2 separate companies (Hewlett Packard Enterprise and HP Inc.), HP intentionally created a diverse board of directors that today is made up of 40% women and 50% minorities. From there, the company dove head-first into their D&I commitments by creating a supplier diversity & inclusion “holdback initiative,” setting standards for all in their supply chain to meet exacting requirements in their businesses, or risk no longer doing business with HP. This past year, in an effort to continue to drive awareness around the importance of diversity and inclusion, HP launched a powerful project dedicated to identifying unconscious bias, entitled "Reinvent Mindsets." The multi-level initiative is an explicit call-to-action around “HP is hiring and talent is the only criteria,” to recruit, retain and promote diverse talent to HP. Reinvent Mindsets supports this mission with a video series aimed at African Americans (“Let’s Get in Touch”), women (“Dads & Daughters”), the LGBTQ community (“Proud Portraits”), and the U.S. Hispanic community (“#LatinoJobs”). The series has been raising awareness of challenges faced by these groups and encouraging dialogue on bias and self-reflection about identity and our subconscious assumptions about others. And they are not finished— HP’s Reinvent Mindsets campaign will next explore engagement with US veterans. With this series, and the dialogue it creates, HP hopes to be a part of not only the solution of creating a more diverse workforce in tech, but to be a part of the larger solution as well. Jennifer Foley is a former 3BL Media employee.